Her open-plan kitchen is in a flat-roof 1958 Anshen and Allen-designed Eichler in the Fairglen neighborhood. Instead of gutting the space, Nagwani and her husband, Bharat, chose to update judiciously while keeping the original speckled brown “Zolatone” cabinets. A multicolored lacquer paint finish still used by auto body shops, Joseph Eichler specified Zolatone in some of his tracts, but it’s unusual to come across an extant installation today. 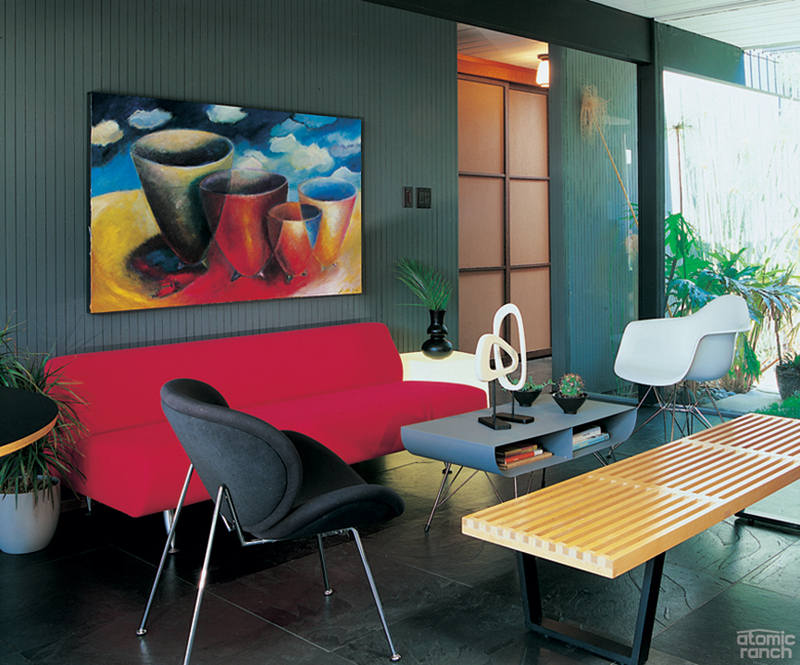 A Noguchi Cyclone table from Knoll and Series 7 chairs designed by Arne Jacobsen comprise the compact dining area in the open family room/kitchen. The Nelson Crisscross bubble lamp and Eye and Ball clocks are all reissues. The central island that holds the vintage Thermador cooktop has been raised on legs to make the surface a more comfortable working height and, along the back wall, a stainless steel counter and backsplash are also new. A GE Profile refrigerator and Fisher & Paykel drawer dishwashers were added, but Nagwani kept the signature pivoting laminate table, which makes a great buffet or a place for daughters Shanti, 12, and Shreya, 9, to work on school projects. The other bad dream connected to the house was readily apparent to anyone driving down the street. Some years earlier an enterprising contractor had convinced more than one Eichler owner to solve leaky roof and insulation problems by installing pitched roofs atop the originals. A few Fairglen homes still have them, as did the Nagwanis’ house when they bought it. Roof aside, the home’s original condition is what really clinched it for Nagwani, but per usual she was representing homebuyers and her duty was to them first and foremost. “For all of the years I was specializing in selling Eichlers, every house went to a client,” she says. 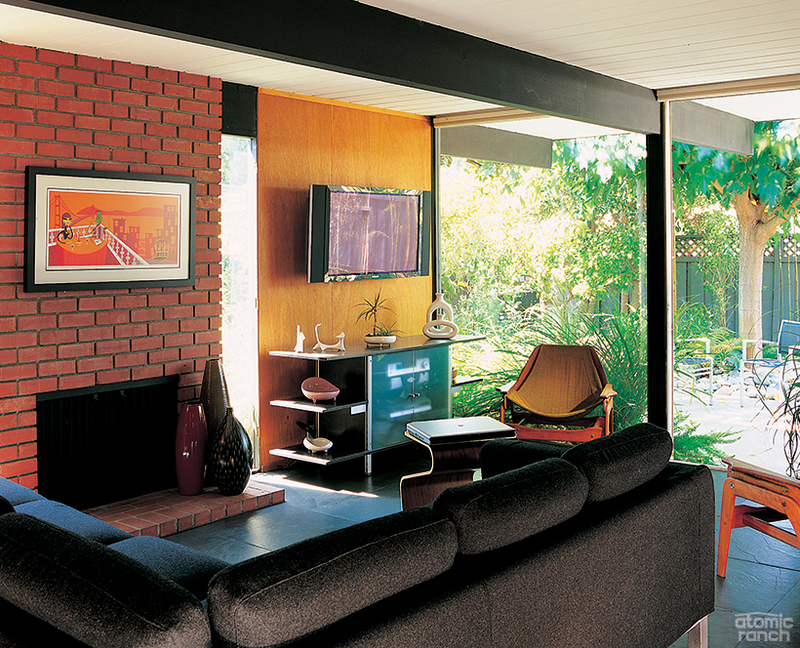 “My husband was threatening to use another realtor so we could find our own Eichler. The couple had the offending roof demolished, put in remote-control skylights, upgraded the electrical system and installed black slate flooring throughout. (An estimate for a skim coat of concrete ran $5,000 more than slate.) They reroofed with insulating rigid foam topped with tar and gravel for aesthetics, and had the missing beams and trellis on the front facade re-created. 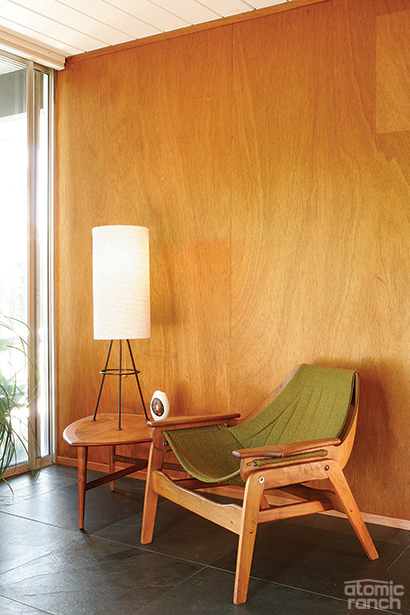 The grooved Eichler siding was repaired, sanded and stained, and the interior mahogany paneling was refurbished. 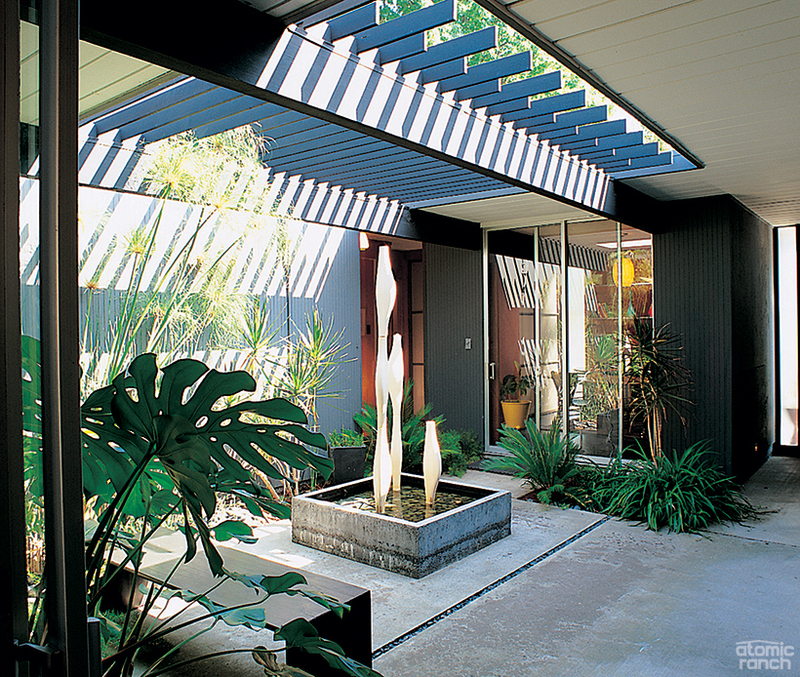 Nagwani was finally able to draw on the resources she developed over years of helping new Eichler owners renovate. 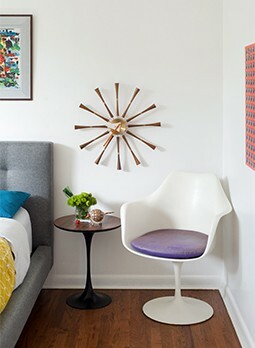 In the living room, an IKEA couch and a custom credenza with doors made from vintage Eichler oblique glass join one of two teak Jerry Johnson chairs that came with the house. A flat-screen TV pivots for viewing, freeing up the fireplace surround for a SHAG print. “One of the most important things is, when you walk in the front door, nothing should stop your eye but the back fence,” she instructs. “That may mean painting out the posts so that they disappear, or making sure your materials are consistent, or putting in the best flooring and making it the same throughout the house. It shouldn’t be carpet and it shouldn’t draw too much attention away from the architecture, and it should contrast with the walls. Slate, VCT, cork, bamboo, polished concrete, terrazzo, linoleum—they all work. Industrial designer Steve Escobar made the fountain sculptures in the atrium.